Manufactured to the highest quality standards, LenzFlip® lenses are made from 100% Polycarbonate material through a multi-staged thermoforming process, resulting in an extremely tough and robust lens with superior optical quality. Carved using advanced laser-guided precision edging technology; the lenses are carved to exacting dimensions ensuring a perfect fit and fuss-free installation. 4 Stage Lens for Superior Performance 1. Scratch Resistant Exterior Coating 2. Optical Quality Polycarbonate with 100% UV Protection 3. High Efficiency Polarized Film 4. Optical Quality Polycarbonate Perfect Fit Crafted using state of the art edging (cutting) equipment that utilizes laser guidance to craft the lenses to the right dimensions and size, ensuring a perfect fit for the frame. All lenses undergo very strict testing and continuous evaluation to ensure the exact specifications of the brand manufacturer are matched accurately. 100% Polarized The entire line of LenzFlip® lenses are polarized, providing users with glare-free vision. Compared to non-polarized lenses, polarized lenses eliminate 100% of glare-causing horizontally oriented light, providing crisp and clear vision. 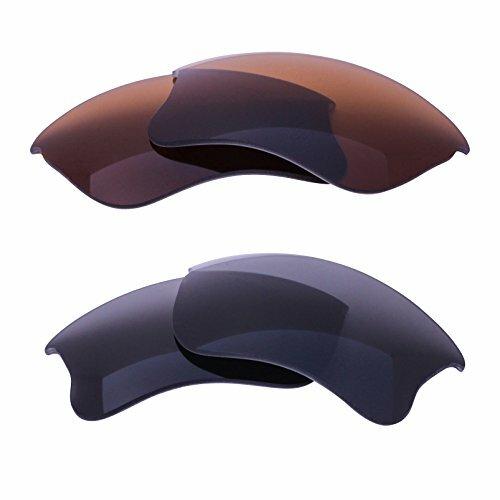 Polarized lenses also reduce eye strain and improve overall visual comfort. Unlike competitors, LenFlip's polarization technology is based on encapsulating the polarization film within the lenses, rather than using a polarized coating on the lens which can separate or fall off over time. 100% UV Protection LenzFlip® lenses provide the user with 100% protection from harmful UV rays that can damage the eyes over time. All lenses have UV protection built within the polycarbonate material itself, providing the user lasting UV protection that never wears off. PROUDLY CRAFTED IN THE U.S.A. LENS THICKNESS Unlike our competitors, our lens thickness is 1.5mm, ensuring there is no rattling in the frame and will have a secure fit. If you have any questions about this product by LenzFlip, contact us by completing and submitting the form below. If you are looking for a specif part number, please include it with your message.